Tweezerman is the brand which is chosen by most of celebrities, discerning customers and beauty professionals for over 35 years. Tweezerman features cutting edge beauty tools, selling them through professional beauty suppliers such as cosmetic and specialized shops, stores and departments. Beauty addicts worldwide associate this brand and its beauty tools with premium quality. Tweezerman offers products for manicure, pedicure, brow and lashes grooming, face, hand, foot and nail care, colors for UV gels, as well as cosmetic products for men’s personal care, offering them in kits and sets. 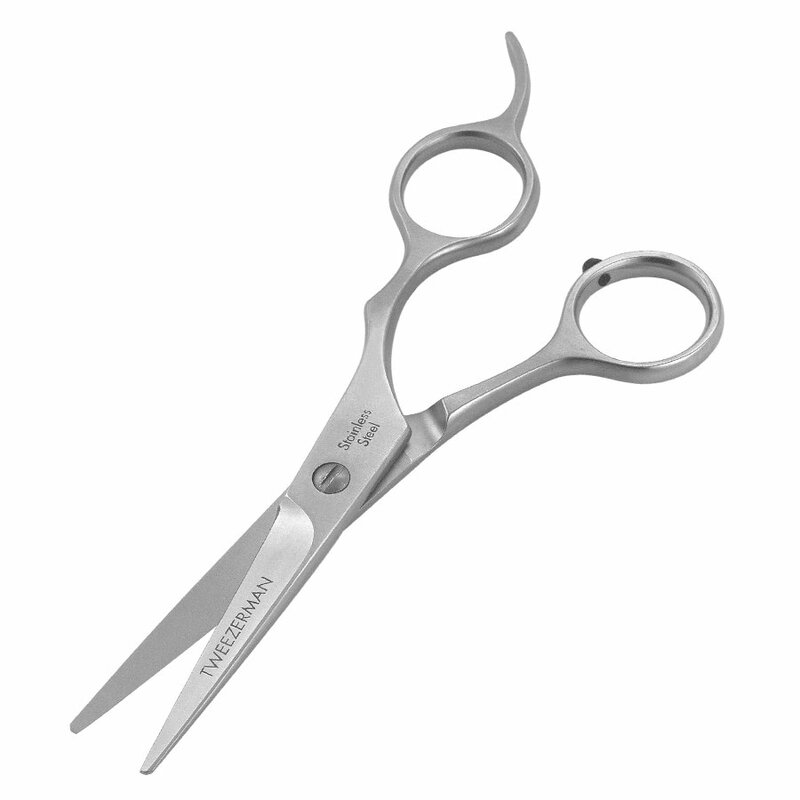 These Tweezerman Stainless 2000 Styling Shears are specially created for optimum comfort, balance and control. They are made of ice tempered stainless steel, providing convex edge cutting blades which are extra sharp and long-lasting. Once their cutting edges stay blunt, Tweezerman ensures free lifetime sharpening, therefore, having these hair scissors you will be able not to worry about their bluntness. These hair shears are 5.5 inches long, but their cutting blades are 2 inches long. These Tweezerman haircut shears have finger rest for comfortable cutting, but it is not removable. It is very important that these hairdresser shears have lifetime warranty against manufacture defects, provided by manufacturer. As mentioned before, these hair cutting scissors are made of ice tempered stainless steel, therefore, they have silver color which is polished, giving them polished silver look. These barber shears feature convex edge blades which are known as extra sharp blades for smooth and precise cut. As these Tweezerman styling shears are cutting shears they are suitable for a lot of various hair cutting techniques, for example, slice, chip, point and blunt cutting techniques. Taking into account this product’s price, both professionals and students can afford it, therefore, students can practice with high quality shears, without paying high price. These Tweezerman Stainless 2000 Styling Shears are scissors for hair cutting. Thanks to their material – ice tempered stainless steel – they are incredibly lightweight and have polished silver look. This product has 2 inches long convex edge cutting blades, but its total length is 5.5 inches. Unfortunately their tension is not adjustable, but they have extra sharp cutting blades which provide easy cutting and non removable finger rest which ensures comfort all work day long. These cutting blades are also long-lasting, but if they loose ability to cut, you can get in touch with manufacturer, because they guarantee free lifetime sharpening for their products. This Tweezerman product does not include any storage case, therefore, if you need it, you have to buy it separately. These Tweezerman styling shears are suitable for such hair cutting techniques as slide, ship, point and blunt, and they can be used both by professionals and students, because they have not only high quality which is important for professional hairdressers, but also affordable price which is significant for students. It should be mentioned, that Tweezerman ensures not only free lifetime sharpening, but lifetime warranty as well, indicating premium quality.